IFA 2010 threw up a few new exciting bits of kit, such as the Samsung Galaxy Tab, but it's at the mid-range of the market that some interesting gadgets were to be found. 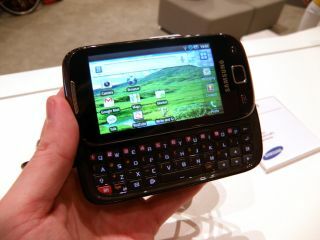 Samsung told TechRadar that it was planning a budget Android QWERTY-slider in 2010, and while it wouldn't give the name, as coincidence would have it the Samsung Galaxy i5510 appeared on Vodafone Germany's stand. Samsung told us that the new Galaxy handset would be similar in spec to the Galaxy Apollo, a mid-range phone that debuted earlier this year, and the Galaxy i5510 certainly fits that bill. It's got a very basic-yet-sleek design, with a shiny plastic chassis and three simple buttons on the front, with the menu key doubling as a search button via a long press. It fits nicely in the hand, with a roughly 3.2-inch screen (we didn't have a tape measure in our gadget utility belt) and the LCD screen was bright and clear enough, although we reckon it's only coming in at HVGA resolution at best. The keyboard takes a lot of cues from the Samsung Genio Slide – another QWERTY from the Korean firm, but using its proprietary OS rather than Google's Android. The keys were well-spaced and easy to hit, with a lot of secondary functions all around – in particular we loved the '.com' option above the full stop. However, the keys are flush with the chassis, and can be a little hard to hit when your fingers are flying across the surface. A 3.5mm headphone jack is included too (as you'd expect from a phone such as this these days) and is positioned nicely out of the way on the top right hand side of the phone. The camera is quoted as being 5MP, but in our tests only showed up as 3MP resolution – we're not sure if it's an early software issue or an over-exaggeration from Vodafone, but either way, it doesn't come with a flash. The main winner here is Android 2.2 already on board though – Wi-Fi hotspot-enabled and a speedy UI help put this head and shoulders above the other budget Samsung phones. Sadly, flash video wasn't enabled on the device we were playing with – there wasn't an option to turn it on in the settings, so we're hoping that's a pre-production or regional issue, as we're expecting all Android phones going forward to pack Flash support. The internet experience was solid though, with quick loading times and the text reflow option we've come to expect from Samsung's Galaxy range. However, once you've pinch and zoomed in, you still need to double tap to activate the text resizing, which seems a little odd. We're hoping to see this slinky slider in the next month or two from Samsung, and with a recession-proof price to boot... if this comes in at under £300 SIM free then it will be an excellent budget option for the Android family.